It may be a niche effect, but the Shaker absolutely nails the vibe. TonePrints offer huge choice. Vibrato tones are great. 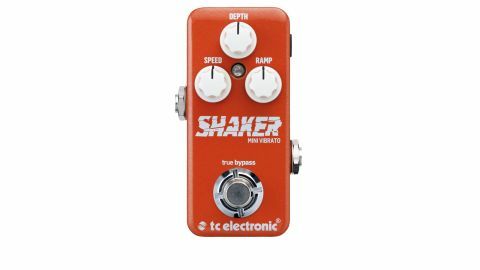 While the market is loaded with teeny pedals, TC Electronic's new Mini range - including the Shaker vibrato on review here - has one major advantage over its competitors: TonePrints. "As well as artist-designed sounds, you can also create TonePrints on your computer using the TonePrint Editor software"
Simply hold your iOS or Android device up to your guitar pickups, select a preset from the TonePrint app, and the 'Print is beamed straight to your pedal. As well as artist-designed sounds, you can also create TonePrints on your computer using the TonePrint Editor software, and transfer them via USB. A relative rarity on guitarists' pedalboards, vibrato is an effect that slowly varies your guitar's pitch. The Shaker Mini delivers these psychedelic sounds with aplomb: slower rates yield a gentle seasick vibe, but cranking the speed knob gets you into Black Hole Sun Leslie territory. You can even set the footswitch for momentary bursts of wobble via the TonePrint Editor, while the ramp control adjusts how quickly the sound goes from dry to full-on vibrato.